With the Brexit decision tree we shared earlier this year we aimed to make sense of what at times has seemed a senseless situation. There are still many unknowns, but with new information starting to shine through in the last month, we are now publishing an update. We’re so pleased that the Brexit “decision tree” we shared earlier this year seems to have helped so many of you make sense of what at times has seemed a senseless situation. We value parsimony and elegance in our research, and we resisted tinkering with its structure while the fog was yet to lift. Yet new information has started to shine through in the last month, and while there are still many unknowns, we are now publishing an update. Of course, as ever, we do not pretend to know what the outcome will be. But, to paraphrase our previous note, stopping at “we don’t know” is not good enough. For sure, our job isn’t to provide political commentary, but politics is having a meaningful impact on UK financial markets and resigning ourselves to a shrug of the shoulders would mean we’re not thinking hard enough. Stopping at “we don’t know” today could also make us slow to react tomorrow if the situation clarifies. And stopping at “we don’t know” is actually a missed opportunity. It turns out there’s actually quite a lot of information in “we don’t know” if we break down the overarching conundrum into a sequence of smaller questions. When we work our way down the tree to the possible outcomes in red and calculate their conditional probability, we find that they are not all equally likely, even if we have expressed “we don’t know” mathematically at a number of nodal points. Please bear in mind that we have kept our tree simple. We’re not trying to capture Brexit’s full gestalt and we are sure you can come up with additional nuance. We think it’s more helpful and more workable to reduce it down to the most crucial points. In August, the decision tree suggested our “never-ending story” was the most likely scenario. By this we meant a Brexit deal de minimis, with the salient details still to be hammered out during an extended negotiating period. We now know that a deal de minimis is the only deal that the government intends to present to Parliament. Despite its 585-page length, the current agreement is little more than a series of declarations of intent to negotiate terms by the end of the transition period. It is so light in detail that it doesn’t actually contain the phrases “financial services” or “single market” – we almost refused to believe it when we first pored over the document late on the evening of its long-awaited publication! We hadn’t anticipated that even such a can-kicking, bare bones agreement would still need to be ratified by Parliament. The “Irish backstop” makes ratification contentious. The backstop is an insurance policy to ensure Ireland’s border with Northern Ireland remains open. Essentially it means that Northern Ireland would stay aligned to the rules of the EU single market programme at the end of the transition period if no deal was agreed. It would also involve a temporary single custom territory, which would keep the whole of the UK in the EU customs union, until a wider deal or a technological solution can be agreed by both sides. We don’t know if the deal de minimis will pass Parliament. 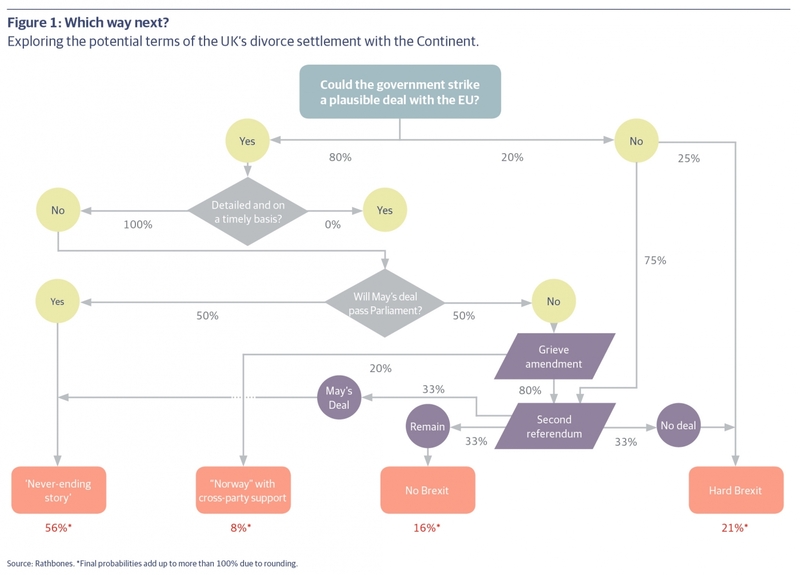 But as you will know by now, there is still information in saying “we don’t know” – or rather applying 50-50 odds – thanks to our decision tree and its contingent probabilities. The most staunchly pro-Brexit Conservative MPs, known as the European Research Group and numbering c.60-80, have condemned the backstop vituperatively. Yet they may be brought around if the alternative is a second referendum and the risk of no Brexit at all (more on that below). Given the bare bones nature of the rest of the deal, they may feel it is better to guarantee Brexit and then shape its nature subsequently. If May’s deal fails to pass, MPs can now table their own amendments, after the Europhile rebel Conservative, Dominic Grieve, defeated the government in a vote in early December to grant the House that right. Grieve and some fellow rebels, such as Nick Boles or Damian Green, would prefer to maintain a very close relationship with the EU, much like the arrangement Norway has. If such an arrangement is tabled, a grand coalition in the House could form to pass it, but given the parliamentary arithmetic it would likely need some May loyalists to join the mutiny. We believe a second referendum is a more likely outcome. It could also arise if May is unable to extract any extra assurances from the EU about the nature of the Irish backstop, given that the government has started to reveal a reluctance to avoid an “accidental” hard Brexit. We do not pretend to know the exact nature of a second referendum or its result. Will it be a choice between remain or no-deal, or will May’s deal be an option? We’ve assigned equal odds to all three. So, in sum, the most likely outcome is still the “never-ending story”. In fact its odds have increased to 56%, from 40% previously. To be clear, the “never-ending story” may ultimately end in either a soft or hard Brexit down the line. Indeed we think it probably increases the chance of a softer Brexit, but we’ve constructed this decision tree with a one-year time horizon. Unfortunately, this would mean that the cloud of uncertainty hanging over the economy would remain. It would continue to weigh on UK financial markets and delay business investment. The next likely scenario, at 21% is still a no-deal/hard Brexit. You may recall that we purposefully left out a general election from our decision tree, even though it could theoretically sever any number of branches. We excluded it for two reasons. First, as far as Brexit is concerned, a new government would arguably loop us back to the top of the tree, while a Corbyn-led government may have profound implications for financial markets well beyond what it might mean for the UK’s relationship with the EU. Of course it is a possibility, but we feel the Fixed Term Parliament Act 2011 makes this rather unlikely. According to this Act, an early election requires either a motion supported by two-thirds of MPs or the government losing two votes of confidence in two weeks. There are simply not the numbers to support a two-thirds majority motion. ERG rebels may call a vote of confidence, but given that the Conservatives are barely ahead in the polls this seems like a massive gamble. Second, we believed that a leadership contest was more likely in the first instance, and May was likely to win. Our assumption turned out be correct. May’s position is now strengthened: under party rules another contest cannot be held for another 12 months. 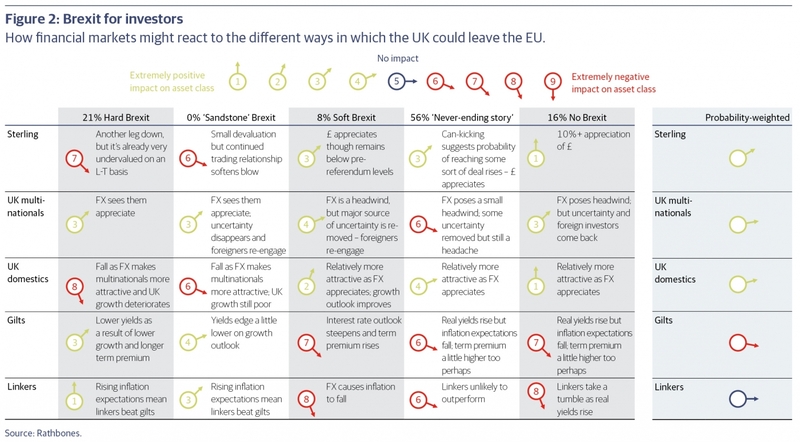 As before, figure 2 below assesses the impact of each outcome on five key asset classes: sterling, UK-listed multinational companies, more domestically-focused UK companies, and both conventional and inflation-linked UK government bonds (‘gilts’ and ‘linkers’). We haven’t changed anything, other than the probabilities we assign to each scenario, of course, and therefore the probability-weighted outcome in the rightmost column. Brexit is not a globally systemic event and non-UK markets are unlikely to move in response. Only 3% of the revenues earned by US companies originate in the UK; just 6% for non-UK European companies. Even FTSE 350 firms make just 25-30% of their revenue in the UK. The table contains brief explanatory notes, but some further reasoning may help. Our analysis suggests that sterling is already priced for a fairly hard Brexit. If Brexit were abandoned, we expect the pound would go up by more than it would fall in the event of a hard Brexit. On a long-run basis – the only timeframe over which we believe currency forecasts can be made with any certitude – sterling is very undervalued (using purchasing power parity or our own Behavioural Equilibrium Exchange Rate, or BEER, framework, which looks at relative prices, relative productivity and relative savings). This holds even when we hypothesise an adverse Brexit scenario. Indeed against the euro, it is still undervalued almost by as much as it has ever been in the last 35 years (although the euro hasn’t existed for that long we can calculate a theoretical exchange rate based on the fixing rate at which the old national currencies joined the euro). A stronger exchange rate would normally weaken shares of multinational companies listed in the UK, holding all other things equal. Remember how the FTSE 100 outperformed immediately after the referendum and indeed for the rest of 2016, before underperforming dramatically for the next 12 months or so as foreign investors sold UK companies indiscriminately (regardless of their exposure to UK revenues). But there is a good case for a softer Brexit resulting in both a stronger pound and a stronger FTSE. That’s because the FTSE is so under-owned by global investors. The latest BoA Merrill Lynch Fund Manager survey tells us that investors around the world are more or less the most underweight UK-listed equities they have been in the poll’s history. The national accounts tell us that net outflows from UK equities were larger after the referendum than at any time since 2007. If a hard Brexit starts to appear more likely, UK multinationals may be so under-owned further selling could be limited and the exchange-rate effect should dominate. Weighting together the political probabilities suggests to us that, on balance, sterling is likely to appreciate and UK multinational companies should also do well. The arrows slope upward only gently and performance is likely to be unusually volatile until one of our scenarios is certain: risk-adjusted returns could be unfavourable. Nevertheless, the exercise shows that there is some risk of sterling gains, which could erode returns from overseas assets given the current political outlook. “We don’t know” doesn’t lead us to “sell the UK”.